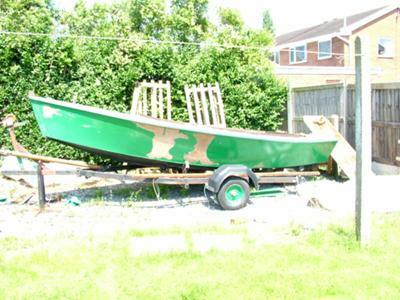 I bought this 17 ft open ply boat, single chine, shallow V, with a centre board. She must be 30 years old but very solid. Any one recognise the breed? I think Plato also implied that without small stones the large ones meant nothing. Can't see through the tarp !!! What the heck, you are taunting us without better photos !!!!! Please submit more as soon as possible !!! Mine is a simple tale I returned home to the UK from Spain a poorer but wiser man, back at home I began to dream about a boat. 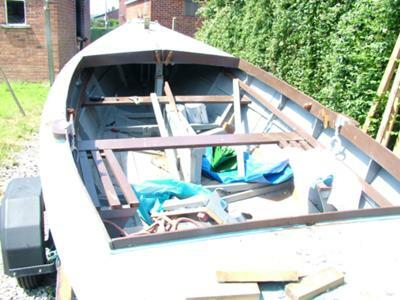 My last boat had been a hundred year old restoration project. 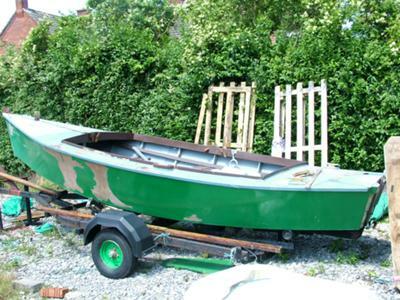 I now wanted something simple, a friend offered me a 17ft ply ‘V’ bottom skiff of American design it looked good so I bought her. She had no name so she was christened “Kalista”. Then things started to get more intense the project took on more work even forsaking paid labour. So far I have started to examine the hull and it looks good. A decision was made to strip all the paint and start again and that my friends is where I am up to at the moment ,but it aint simple. Keep us posted with some pictures. 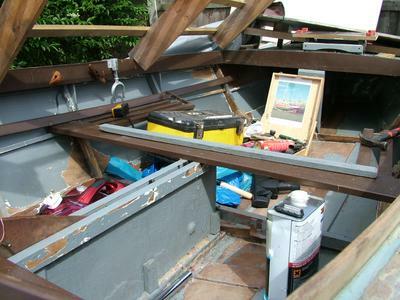 Started stripping the paint but before that I had to remove half of the beach from inside the boat. The whole process is quite calming in a strange way. The mystifying bit is why has some paint really stuck to the ply and in other areas it comes off in easy strips? I am really enjoying this project it has so many threads, such as planning the rigging, mast, sail plan and where to launch to name a few. And as it’s my boat I do not feel the need to justify my quirks, such as will it be a cutter or a sloop maybe I will try a boomless setup. Post a few more pics with her uncovered. Maybe we can identify the source. 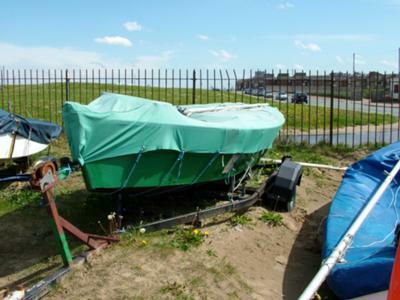 The plot thickens I have now joined the local sailing club which has a compound that will let me have access to the River Dee. The paint is coming off in good style and as yet no horrors have been uncovered. I have made an active decision that at this point I will concentrate on getting the boat in a respectable and safe condition. The dilemma was restore, rebuild or refurbish I have chosen refurbish but later on who knows. I am still pondering on the sail plan, the mast is stepped 5ft from the bow and is through to the keel and it looks like there was a second mast just forward of the tiller. 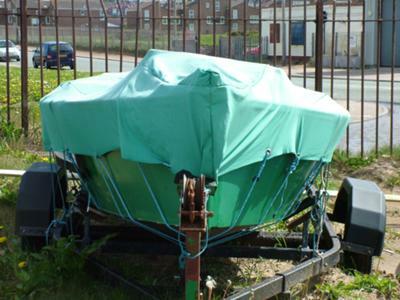 But for now I will just work on getting the hull in good order and continue trawling the net and hopefully some good advice may come and some kind soul will recognise the old girl and throw in a helpful word or two as I said it aint simple. In response to requests will put more pictures on. Comments for Simple Boating 3 "Kalista"
Did you submit you post and pics on this form here? Just spent a long time entering a comment but when i tried to enter my pictures it all went s*** shaped and disappeared oh fie. I was thinking of the Wayfarer but they are just under 16ft and have an extra chine. Did she come with any sails, the main might have a number or class ID on it? Or could she be a one off? I can’t think of an existing class she could belong to in the UK. But if you aren’t into racing does it really matter? She looks like she will be a fine stable fun boat to sail. I thought it might be a Comet or a Blue Jay, which are both class boats in the US. Unfortunately they are too short, but have very close to the same lines. at least you can rule them out. After much digging and probing I have found no real problems but I have re-discovered that crawling about a 17 ft boat can be quite demanding on your body! I am amazed that a 30 year plus ply boat can be so well preserved. Most of the work is being done using hand tools as I quite like the lack of screaming electric motors it might be slow but its good. The biggest part of the work so far has been cleaning and scraping and I do not see that ending for a while but it allows time to dream and plan. The next steps in a considered manner. That's good news, turning her into a gaff cutter is a really good idea, have you got or are you putting a bowsprit on for the cutter rig? Being an open boat the air can get to her so rot is less likely, get into the habit of leaving her hatches open and she will stay that way. 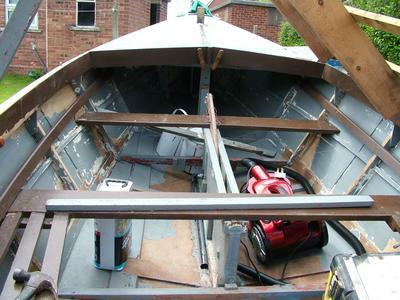 Work moves on ,the inside has now had all the loose paint removed and the rubbing down has started. Preparation for the first primer/undercoat is underway I will use an aluminum based primer and an oil based undercoat and gloss topcoat. The interior is difficult in that there are so many nooks and crannies but slowly is the rule and methodical is the manner. 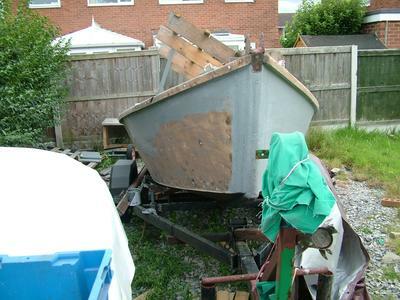 Now onto the hull, it has been burnt off and is nearly ready for paint, the seams will be epoxied and taped where necessary. I have started to list out required materials and will order as each stage is arrived at. My biggest problem at the moment, strangely is not time or money but weather, our nonexistent summer is the real culprit but rainy days allow for dreaming. Kalista is now becoming a proper project. 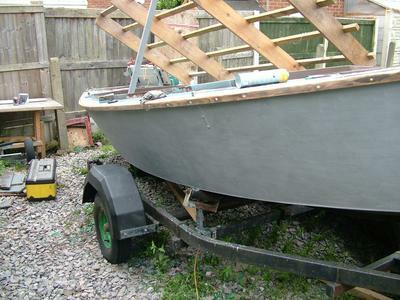 I am happy to say that the first coat of primer has gone on and I think she is beginning to look all right. I have adopted some of Mr Paysons methods for priming the plywood. I will now start thinking about rigging, I am going to try and keep to old school were possible. David - this seems to be coming along splendidly. I do hope you are not using Mr. Payson's technique in the most literal sense. Haha. If so I do hope you have taken appropriate health and safety precautions. Anyway good luck and I will continue checking in on you. Kalista at this stage is now ready for finish coats to be applied to the outside. The inside is a different matter, I fear I have many hours of preparation before I will see much improvement. However I keep on going as and when the weather allows (oh for a warm workshop). I have to keep reminding myself that in bygone days boat were built on the beach or in a field (read Slocum for instance ). "Kalista" never ceases to amaze me that at her age there is no real rot, I am very happy that this project is going well. Next on the plan is rig and rigging, after that the trailer has to be restored and who knows, we may get to launch soon after that. I have a date in my mind and will work towards that. 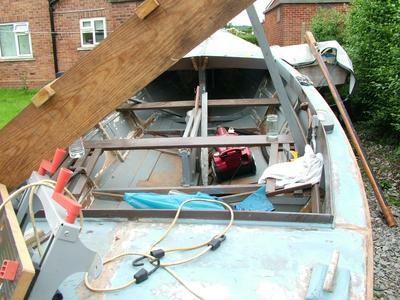 At present work on "kalista" is on hold as working in the open when its raining aint no fun. 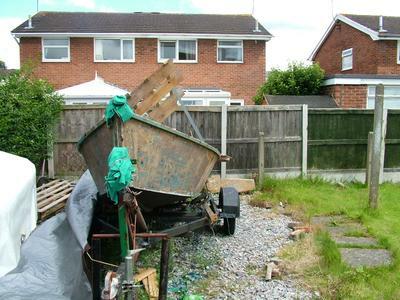 However I continue to gather materials and study possibilities as to where to keep her when she is ready for the water. I haves settled on the rig as a boom-less gaff cutter. And am contemplating an electric outboard as I do not intend to do much powered boating and will probably use her on inland waters. 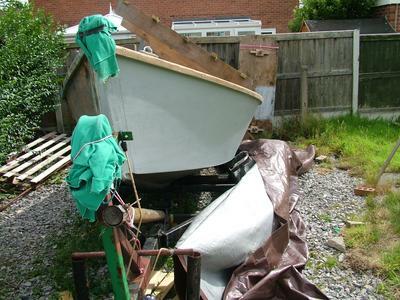 The story of Kalista continues, not so much in the restoration but more as to where I want to keep and sail her for now I have settled on a large lake in North Wales UK as my base the boat. 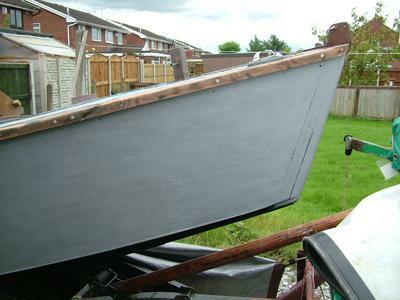 Work moves along apace, the first coat of colour (dark cherry)has been applied and looks good (well I think so) the rest of the boat will be cream. 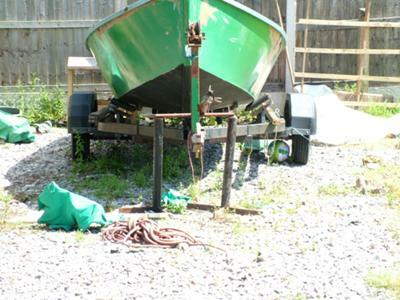 Running gear not yet finalised but it does look like a gaffer with a short jib, the mast will have a couple of stays. 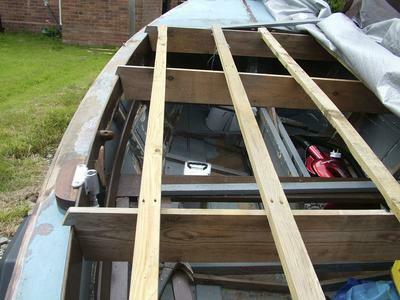 I am trying to use as many traditional methods as possible on such a small boat, in a nut shell 17 ft shallow v bottom centre board no engine home made oars. Hopefully lots of fun to sail. Next episode will have current pictures. I have got a set of nearly new bermudian sails which I want convert to gaff, these come from a GP14 any one out there done a conversion from bermudan to gaff? Oh bye the way I am looking to make the sail boomless.